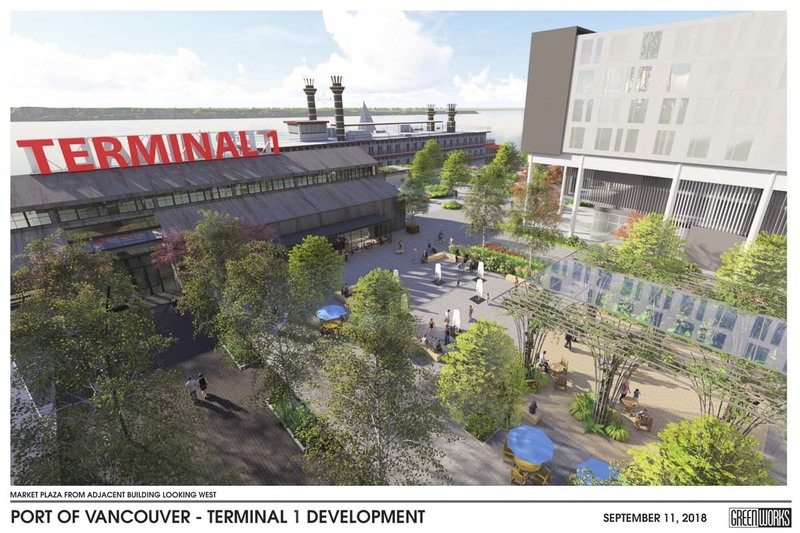 VANCOUVER — More than two months since the public got its first look at several concepts for a redesigned Terminal 1 space west of the Interstate Bridge, the Port of Vancouver showed off its preferred design plan for the site this week. People filtered through the event space inside the Warehouse 23 building — the latest in a long line of uses for the century-old building that gave birth to the Port of Vancouver — checking out sketches and a computer-generated video showing off what the space could eventually become. 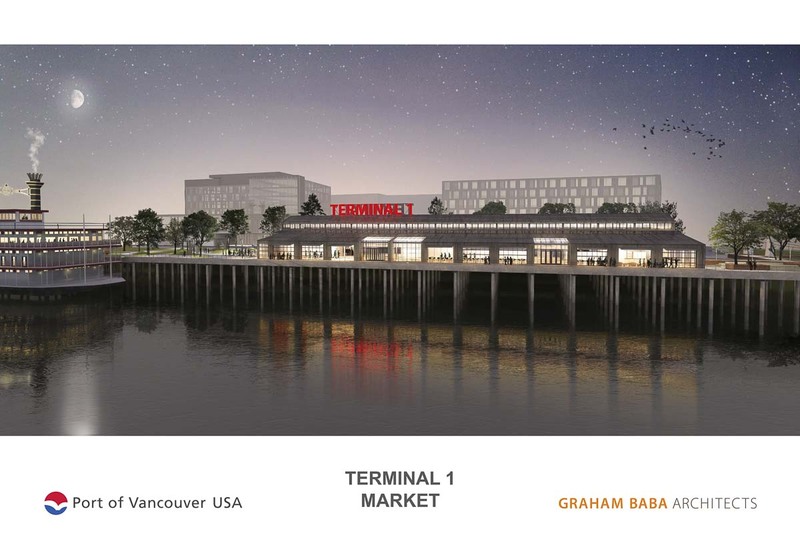 The Port hired Graham Baba Architects of Seattle to design the public market building which will replace the old Terminal 1 warehouse. What the Port especially wanted was a project that compliments, but doesn’t mirror what Vancouver is doing with their $1.5 billion waterfront development. Gill Williams, the principal at Greenworks, a Portland landscape design firm designing many of the outdoor spaces, says the Port actually allowed them to comb through old warehouses, looking for defunct pieces of equipment that could be repurposed in the site, either as art pieces, or interpretive pieces to show off the history of the Terminal 1 site, as well as the Native American tribes who used the land before the city even existed. Part of that emphasis on historic preservation includes repurposing as much of the existing Terminal 1 building as possible in the public market structure. Graham Baba has designed several other public market buildings, but this one presents opportunities they haven’t been able to explore before. The immediate sense of the conceptual designs is one that caters to pedestrians and bicyclists. The Terminal 1 property sits in-between Vancouver’s new waterfront park, and the existing Renaissance Trail to the east of the Interstate Bridge. One new element added from previous design concepts is an eastern portal that would connect with the existing Renaissance Trail, as well as the new waterfront park to the west. Pedestrians coming from downtown will flow across Columbia Boulevard, which could be closed down to create a larger public space for events, through a corridor of multi-use buildings. As they approach the public market building, the space opens up to include first a covered square, and then an open square with fountains that could be turned on or off depending on need. The existing amphitheater west of the Terminal 1 building would give way to an area with natural areas, public seating, and a view of the Columbia River. The boardwalk that runs along the southern edge of the market building would extend west, curving with the river and eventually rejoining the Renaissance Trail. Williams says the idea is to give people plenty of outdoor space to enjoy when the weather is good, but not make the space unusable during the region’s cooler and wetter seasons. Now that the conceptual design work has been completed, the next step is to do a 30 percent design, says Eder. That will allow the Port to get a better idea of what the entire project could actually cost. 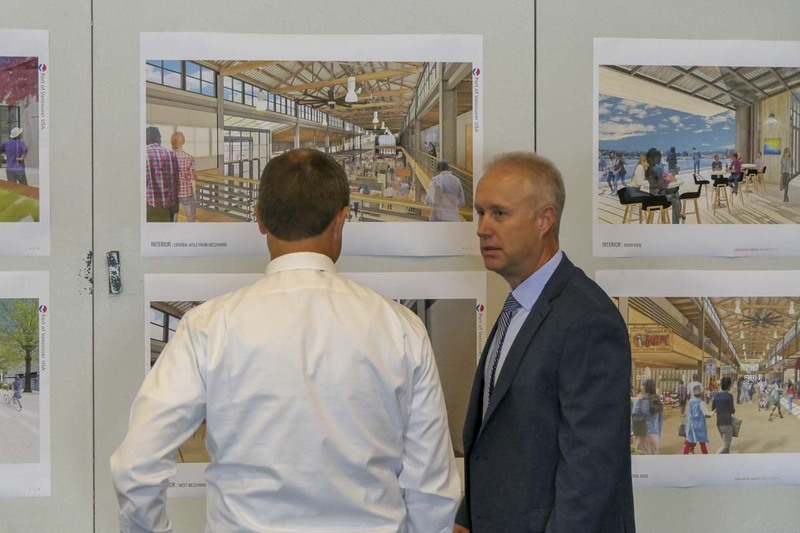 The largest project will be to tear down much of the existing dock structure, and relocate the Public Market building slightly further to the west. The existing dock isn’t up to code, and the building needs to move to allow room for a possible I-5 bridge replacement project in the future. Initial estimates put the cost of replacing the dock and improving the shoreline at around $30 million. The Terminal 1 site is split up into several blocks, and Eder says they’ve already had interest from developers in using the property. The Port would continue to own the land and lease it out. The goal would be to find either one large developer for the entire site, or several that are willing to assist the Port with some projects in exchange for being able to develop on the site. There is already a new 160-room AC by Marriott hotel planned for the site, and Eder says there’s a chance the development could flow out from around that. 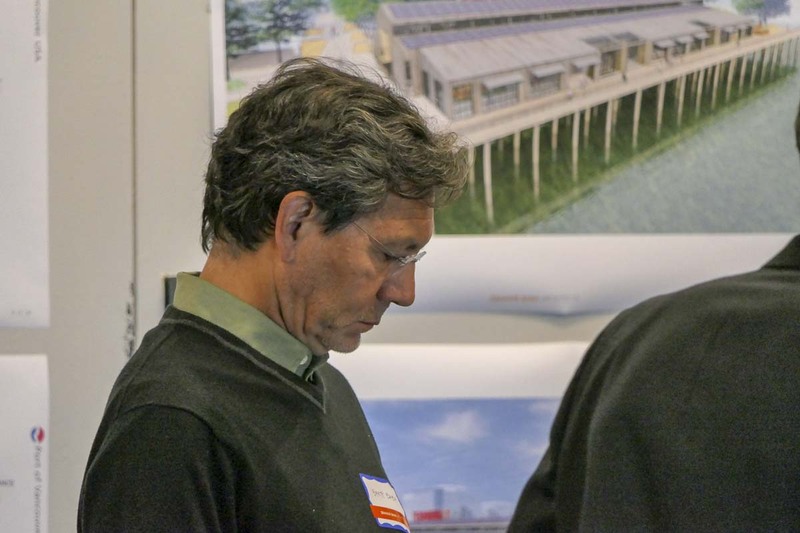 The hope is that some of the public spaces, such as the open square, and the public areas to the west of the public market building can be developed first. There are some restrictions for developers to be aware of at the Terminal 1 site. 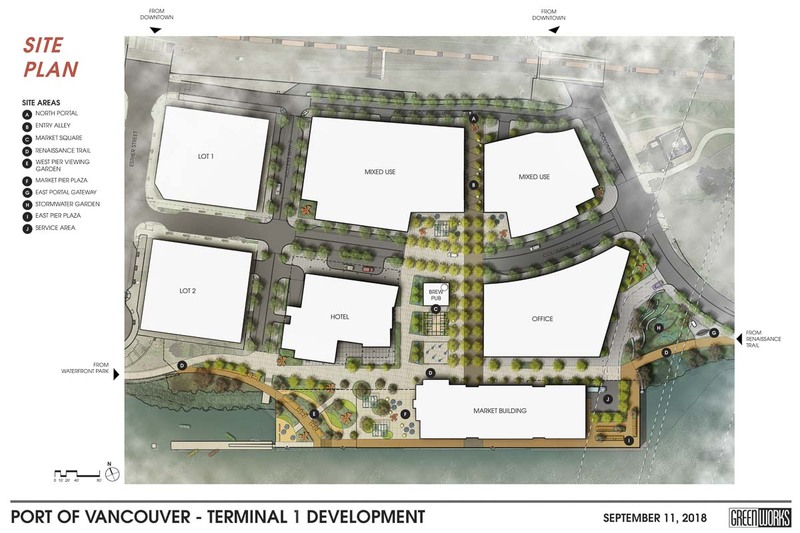 While the Port is looking to build something different at the Terminal 1 site compared to Vancouver’s waterfront development, Eder readily admits that having that project nearly completed makes it much easier to approach developers about their plans. The Vancouver waterfront project took over two decades to go from concept to near completion. Eder says he doubts the Port’s Terminal 1 plans will take quite so long to accomplish. In fact, he says he gets to take his children down to the site and tell them to take a good look, because it’s all going to look much, much different in the very near future.